A couple of weeks ago, I got an awesome box of toy goodies from the Big Toy Book. One of the toys in the box caught my eye immediately because it was something I played with as a little girl – it was a box of Tinkertoy! I couldn’t believe it. Talk about an old classic. 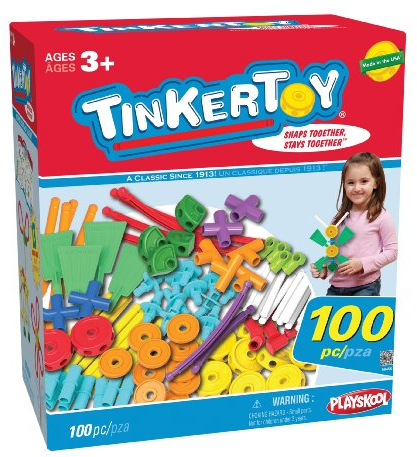 In fact, Tinkertoy has been around since 1913 so that pretty much makes me think that maybe even my grandparents were playing with Tinkertoy as kids… you know that something that’s still going strong 4 generations later is a winner of a product. They’re a little more colorful than I remember (see above) but the same classic concept – snapping, building and playing. children helps the little one understand what shapes are all about. You can also use their hands a bit which makes them develop their word recognition and building skills.